What is the Foundation Years? 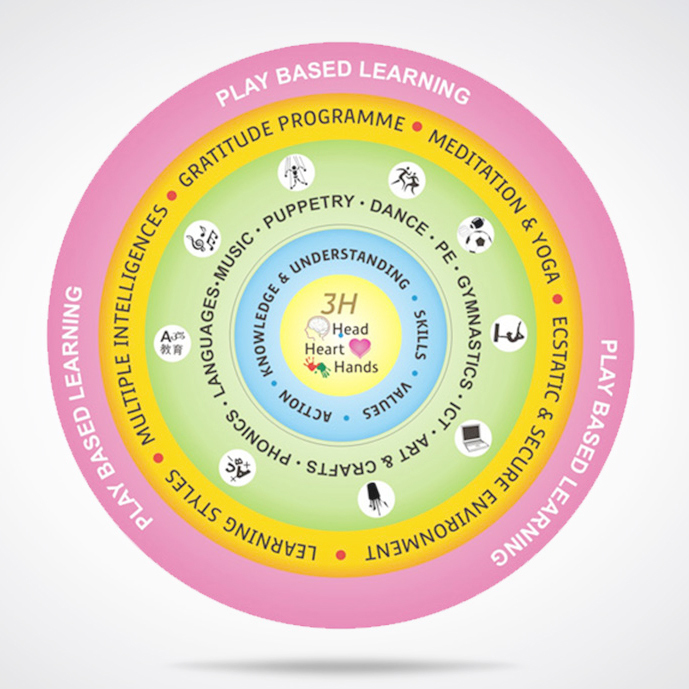 The Foundation Years is a holistic educational programme using the concepts of ‘Multiple Intelligences’ and ‘Individual Learning Style’ founded by Howard Gardner. This programme is designed in a way that allows infants and toddlers to grow spiritually, emotionally, mentally and physically. The Foundation Years retains a vibrant, loving atmosphere which is led by positive energy. This is the first programme that was started by the school. Here emphasis is on creative thinking and creative writing. We believe that children learn best through play. Therefore our specialists facilitate various hands-on experiences to develop every child’s multiple intelligence centre as it has the ability to awaken the joy of creative expressions in children, be it art, music or any other field. With a little effort we may unlock a bit of “Einstein” in every child. At the core of the FY curriculum model of the school, 3Hs (Head, Heart and Hands) are placed to ensure the holistic development of children with play enfolding the curriculum elements. We recognize that children, from a very young age, use playing as a medium to explore their surrounding and understand the world. The FY focuses on education which is an amalgamation of a learning environment which is rich and designed keeping in mind different learning styles, multiple intelligences, senses and Encyclopedia data. Although the programme is based on the latest and advanced western science and researches, Vedanta and Indian Philosophy remains the main pillar of the school pedagogy. Our classroom practices involve meditation, brain gym, yoga because it is equally important for children to have a fit mind and body. Children are exposed to different physical education activities and gymnastics to help them develop their fine and gross motor skills. One of the vital inspirations for the VKE FY programme is Dr. Glenn Doman’s research on brain development of new born babies, which explains the ultimate capability of young children to excel in their unimaginable potential. Following Dr. Doman’s teachings, our facilitators are trained to use flash cards, sight words, number dots and several other activities to help the infant bloom.